← The Great American Mountain Rally Revival Is Completed! Saab Wins 1956 Great American Mountain Rally! This week when I was driving Fred Gallagher back to my house after the Great American Mountain Rally Revival, Fred discovered that there was an original advertisement from the February 1957 issue of Motor Trend for sale on eBay in which Saab was touting their win in the 1956 Great American Mountain Rally. As soon as I could after taking Fred to the airport on Monday, I purchased the advertisement and it arrived today. This Saab advertisement is shown below. In 1956/1957 Saab was just beginning to sell cars in the United States. 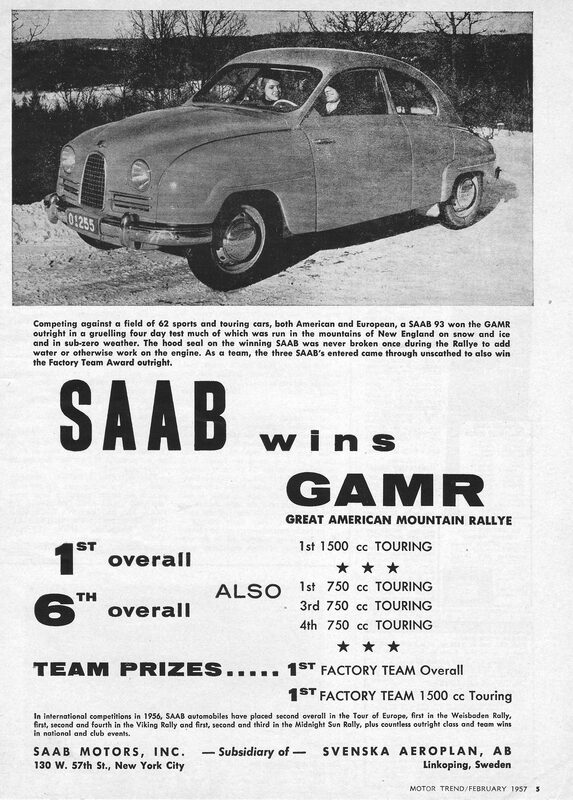 Evidently after the 1956 win at the Great American Mountain Rally (GAMR) , Saab began an advertising campaign in the USA based on its success at GAMR. Car sales in the USA took off at rates that pleased Saab very much. Saab executives clearly saw the benefits of advertising rally victories. On a broader scale, Saab then began to develop and expand their rally program which eventually took them the Erik Carlsson and a widely successful rally program for years. Perhaps all because of the Great American Mountain Rally! This entry was posted in Uncategorized and tagged Great American Mountain Rally. Bookmark the permalink.